Matilda (1990 – February 11, 2006) was a fourteen-ounce hen, and the first chicken to receive the title of World's Oldest Living Chicken from Guinness World Records. She is thought to have been descended from the Red Pyle color variation of the Old English Game breed. She was a pet of Keith and Donna Barton of Bessemer, Alabama, a suburb of Birmingham, Alabama. Matilda's name was taken from "Waltzing Matilda", an old Australian folk song, and given to her as a result of her penchant for stepping side to side (as if she were waltzing) against the wire panels on the sides of her cage. Unlike most hens, Matilda never produced eggs. Her veterinarians believed Matilda's lack of egg production contributed significantly to her extraordinarily long lifespan of sixteen years. Another contributing factor to Matilda's longevity was her having lived the majority of her life indoors, inside a large wire cage, where she enjoyed a stable, protected environment year-round. On October 19, 1990, Keith and Donna went to the Alabama State Fairgrounds in Fairfield, Alabama, and paid $10.00 to purchase Matilda from Steve Shaffield of Warrior, Alabama. Under the stage names of Mort The Mystifying and Donna, Keith and Donna were pursuing their goal of becoming professional magicians, and Matilda was part of their plan. On June 5, 1991, she made her debut performance in Keith's and Donna's magic show. To make Matilda magically appear, Keith would produce an egg from two cardboard tubes, which were shown empty and then nested one inside the other. After cracking the egg, dropping its contents into an empty pan, and adding a few drops of hot sauce, Keith would place the lid on the pan and immediately lift the lid to reveal Matilda in all her glory. Her magic career would span well over a decade. 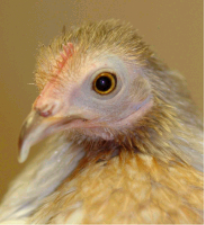 Considering that the average lifespan of a chicken is generally no more than seven to eight years, Keith and Donna contacted Guinness World Records on July 30, 2001, to make them aware that Matilda was eleven years old and still in excellent health. Guinness World Records responded that Matilda's age had to be substantiated. Keith and Donna began completing forms and gathering documentation, which were forwarded directly to Guinness World Records. On April 27, 2004, Guinness World Records proclaimed fourteen-year-old Matilda to be World's Oldest Living Chicken. Keith and Donna were presented with a congratulatory letter and official certificate from Guinness World Records. Matilda's title of World's Oldest Living Chicken is recorded in the data banks at Guinness World Records, but has not been included in their books or on their Web site. As a direct result of Matilda’s receiving the title of World's Oldest Living Chicken; she, Keith, and Donna were guests of Jay Leno on The Tonight Show in an episode that taped and aired on September 9, 2004. Also appearing on the show were Terry Bradshaw, Jim Brown and Howie Long. Musical guests were Kirk Franklin and Yolanda Adams. On September 22, 2005, the Greater Birmingham Humane Society held their annual awards luncheon at The Club in Birmingham, Alabama. The Olivia Bearden Award, which recognizes the specific service of an animal to another living creature (man or animal), was presented to Matilda. Magically appearing to accept her award, Matilda perched proudly on top of the plaque as it was held by Keith. Due to age-related health problems, Matilda retired from show business on October 17, 2005, and died, at the age of sixteen, on February 11, 2006. From the time she received the title of World's Oldest Living Chicken, Matilda lived one year, nine months, and fifteen days. Locating a final resting place for Matilda has proven a challenge. Keith and Donna would prefer Matilda be interred in a place of honor in Alabama, but none has yet been located. Hartsdale Pet Cemetery in Hartsdale, New York is being considered. Until a decision is reached, Matilda is being kept in frozen storage. To honor Matilda's contributions to the world of magic, a Broken Perch Ceremony was conducted on Saturday, August 5, 2006. The ceremony, which was held at the Hilton Birmingham Perimeter Park Hotel in Birmingham, Alabama, was hosted by the Southeastern Association of Magicians and Ring 35 of the International Brotherhood of Magicians. Ring 35 is also known as the Magic City Magic Club and Judge Arnold Drennen Ring. Based on the Broken Wand Ceremony, which was initially performed in 1926 at the funeral of Harry Houdini, the Broken Perch Ceremony for Matilda was a first in magic. Never before had a magician's animal been formally recognized and honored by the magic community. Bob Sanders, President of Ring 35, officiated at the ceremony; Jacque Meyer, Executive Director of the Greater Birmingham Humane Society, delivered the eulogy; and Bill Pitts, Past President of the International Brotherhood Of Magicians, conducted the Broken Perch ritual. In honor of Matilda's many accomplishments, Bob Sanders presented Keith and Donna with a Commendation, which had been drafted by Alabama Governor Bob Riley. The Alabama Veterinary Medical Association inducted Matilda into the Alabama Animal Hall of Fame on September 9, 2006, at a black tie dinner, which was held at Embassy Suites Montgomery Hotel in Montgomery, Alabama. The ceremony was exactly two years to the date on which Matilda had appeared on The Tonight Show. Two dogs, Gucci and Muffin, were also inducted. ^ Barton, Donna (2006). "Matilda". Mort The Mystifying and Donna. Retrieved 2008-07-15. ^ Montana, Chris (May 19, 2004). "World's Oldest Chicken". WBRC-6 News at 5:00 pm. ^ Carter, Cindy (June 22, 2004). "Oldest Chicken". WTTO-21 News at 9:00 pm. ^ Davis, Paul (June 3, 2009). "Magic in Bessemer and the oldest chicken". The Western Star. p. 1A. ^ Plott, Bill (June 17, 2004). "Bessemer lays claim to world's oldest chicken". The Birmingham News. p. 1A. ^ Plott, Bill (September 9, 2004). "Hueytown hen on 'Tonight Show'". The Birmingham News. p. 1B. ^ Leno, Jay (September 9, 2004). "World's Oldest Living Chicken". NBC Universal Studios. Retrieved 2008-07-23. ^ Plott, Bill (September 22, 2004). "Bessemer chicken an old hit on The Tonight Show". The Birmingham News. p. 7S. ^ Strickland, Susan (September 28, 2004). "Animals to receive St. Francis medals". The Birmingham News. p. 6E. ^ News Staff (November 18, 2004). "Tails & Art, a Fifth Annual Benefit . .". Over The Mountain Journal. p. 29. ^ News Staff (June 30, 2005). "The Wet Nose Ball, held in May at the . .". Over The Mountain Journal. p. 22. ^ News Staff (September 8, 2005). "The 2005 Picasso Pets Event Raised . .". Over The Mountain Journal. p. 20. ^ Plott, Bill (September 17, 2005). "Methuselahesque clucker feted". The Birmingham News. p. 16A. ^ Carter, Cindy (September 22, 2005). "Famous Fowl". WTTO-21 News at 9:00 pm. ^ News Staff (October 20, 2005). "The Greater B'ham Humane Society . .". Over The Mountain Journal. p. 20. ^ Plott, Bill (February 14, 2006). "Matilda - world's oldest chicken - dies at age 16". The Birmingham News. p. 3C. ^ News Staff (February 14, 2006). "Famous Bessemer Chicken Dies at 16". WSFA 12 News. Retrieved 2008-07-15. ^ Smith, Jamon (August 6, 2006). "World's oldest chicken starred in magic shows, was on 'Tonight Show'". The Tuscaloosa News. Retrieved 2008-07-15. ^ Plott, Bill (August 4, 2006). "Clucking no more, hen to receive magicians' honors". The Birmingham News. p. 3C. ^ Plott, Bill (September 12, 2006). "2 Jefferson County animals inducted into hall of fame". The Birmingham News. p. 8C. ^ News Staff (September 20, 2006). "Proud bird continues to catch accolades". The Western Star. p. 1B. This page was last edited on 17 September 2018, at 20:34 (UTC).